"Not many people can take the tale of Patrick Braden, aka St. Kitten, who strutted the catwalks, face lit by a halo of flashbulbs, as 'oh!' she shrieks, 'I told you, from my best side darlings.'" There are lots of movies about men who dress like women, but I've never met a character quite like Patrick "Kitten" Braden, who tells his own story in Neil Jordan's Breakfast on Pluto, based on the novel by co-screenwriter Patrick McCabe, who provided the source material for Jordan's The Butcher Boy. Like Jordan's The Crying Game, this is a movie that mixes sexual identity issues with politics, set amid the tension between the British government and the IRA in the late 1960s and early 1970s, but the similarities end there. 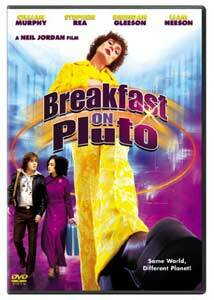 Breakfast on Pluto is hopeful, uplifting, and surprising in ways that have little to do with secrets you are asked not to spoil for your friends. The film opens with a subtitled conversation between two tweeting robins, a good indication that this is a story with magic in it. Certainly Patrick (Cillian Murphy) knows he's destined to live a different life than most boys. Abandoned as a baby on the steps on Father Bernard's (Liam Neeson) parish, he's raised by a humorless woman who, when she discovers him, at 10, in high heels and a dress, swears to parade him up and down the streets that way. "Promise?" asks Patrick, who soon after begins insisting people call him "Kitten." Kitten seems to be gay, though it isn't made clear whether he identifies himself as a woman. It doesn't matter; Kitten is just Kitten. Kitten faces every challenge in life with a smile. It might seem like he's in denial or emotionally stunted, but there are more than a few hints that optimism is the only thing keeping him going. Through sparse narration, Kitten tells the story of his life (in 36 chapters), and it really gets going when he decides to move to London in search of his mother. His only clue is an old address and the fact that she looks like Mitzi Gaynor (though the robins don't necessarily agree that's the case). You may be reminded of Forrest Gump as you watch Kitten's story play out. Like that character, he bounces from place to place, experiencing hardship and happiness but remaining essentially unchanged throughout. While his friends Charlie (Ruth Negga) and Irwin (Laurence Kinlan) get caught up in a terrorist group, Kitten takes up with a musician named Billy Hatchet (Gavin Friday) and is onstage acting as the squaw during a performance of Running Bear. Later, he's being sawed in half and made a target for a knife-throwing magician played by Stephen Rea, who fell for the man dressed as a woman in The Crying Game but is well-informed this time around. It isn't all quite so much fun, but Kitten is never one to wallow in self-pity, a quality that seems to rub off on others. One night, Kitten is in a bar when it is bombed by the IRA, and mistakenly arrested as a cross-dressing terrorist. Police interrogate him for a week, but eventually realize his sing-song questions ("If I wasn't a transvestite terrorist, would you marry me?") are no act. Later, one of the same cops spies him working as a prostitute (a job that takes some work to cheer up, even for Kitten), and instead of arresting him, encourages him to get a job in a peep show, where he'll be safe. The movie takes a lot of detours as Kitten searches for his mother, but the trip is always interesting, and whether he finally finds his Mitzi Gaynor or not isn't really what it's about. Kitten is the story, and Cillian Murphy, whom American audiences know for playing bad guys in Batman movies and Wes Craven thrillers, is pitch-perfect in a role that could easily slip into parody. Jordan's take works, too�scenes of violence and danger don't feel out of place next to the more lighthearted moments because we're always seeing things through Kitten's, shall we say, unique point of view. Breakfast on Pluto is a movie about a man dressed as a woman, but it doesn't deal head-on with the issue like Hedwig and the Angry Inch, which it nevertheless recalls in many ways. Kitten already knows exactly who he is. He just wants to know where he came from, and if you're open to it, you won't mind joining him on his journey one bit. Image Transfer Review: The video transfer is pleasant but not outstanding. Colors are suitably saturated, and while detail is fairly good, the image is a bit soft. I spotted a bit of edge enhancement here and there, but it didn't stand out. The source print shows some dirt in places. Audio Transfer Review: The audio mix suits the film well. Dialogue is clear, and the front soundstage and surrounds come to life with the frequent pop song interludes on soundtrack. A few sequences call for a more bombastic presentation (there's even an explosion!) and sound appropriately robust. Extras Review: Aside from a nine-minute making-of, Breakfast on Pluto includes a commentary from director Neil Jordan and actor Cillian Murphy. It's kind of interesting, as these things go, though it's hard to tell who's talking at times (for about 20 minutes I thought Murphy just didn't have anything to say until I started paying closer attention). Anyway, there are some good production details and Jordan talks about the process of adapting a novel with so many curious qualities. Though there is no trailer for the feature, there are promos for no less than 14 other Sony titles. And for a film with some really interesting theatrical adverts, they sure put together an ugly DVD cover. Yeesh. A fanciful fable about a wholly original individual, Neil Jordan's Breakfast on Pluto hit me just right. It's an endlessly entertaining mix of near-camp comedy and political commentary, and a lot of fun.